Packing Size: 29.53" x 69.29" x 3.35"
These poster holdersare designed to give your advertisements, posters, directional signs and informations about sales, special offers or events, the best visibility in indoor spaces. 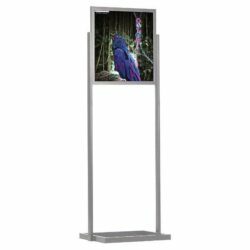 With a satin silver finish and the top insert sign channel feature these aliminum poster stands provide an elegant look allowing you to display your prints easily yet efficiently. 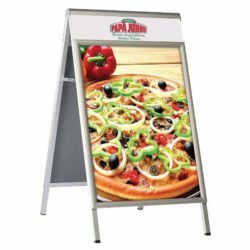 Thesesign displaysare constructed from durable material which makes theposter holdersconvenient for use in busy public areas as well as providing a stylish look that suits various environments. In order to place your images, all you have to do is simply slide them in between the two non-glare lens and into the sign channel which measures 1/4″d. 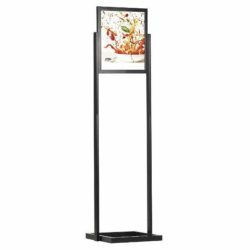 Theseposter standscan hold any 24″ x 36″ prints double sided and with the height of 66″ tall, your images will be visible from all angles in busy areas such as lobbies, hallways, shops, groceries, banks and cafes and restaurants. 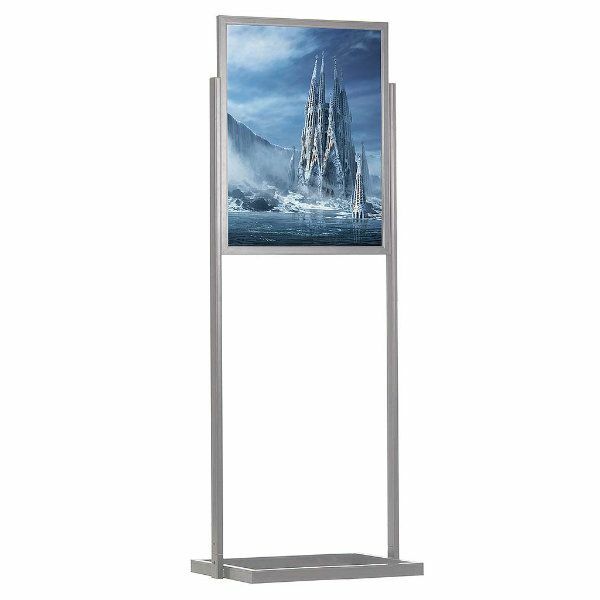 You can use the poster stands to display all sorts of announcements, event informations, warnings as well as using these poster stands as directional signs andmenu holders. 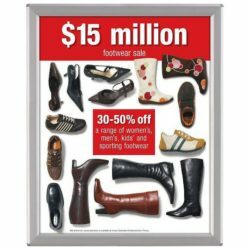 With the double sided feature theseposter holdersare what you need in order to draw attention to your advertisements, plus the anti-glare lenses provide them a clear visibility. Changing your graphics has never been easier with the top insert sign channel feature! The product is shipped demounted to reduce the shipping costs. If you check out ourposter standssection you will find a large collection ofmenu holders, sign displays and poster holdersthat come in different sizes suitable for many uses. Order today and make your advertisement visible in a new fashionable way at a reasonable price!